Main point: vendors should stay for more than the showcase. Carol and I returned home from the Charleston Conference Friday night, after stopping by the nephews’ house on the way home for a short play date. 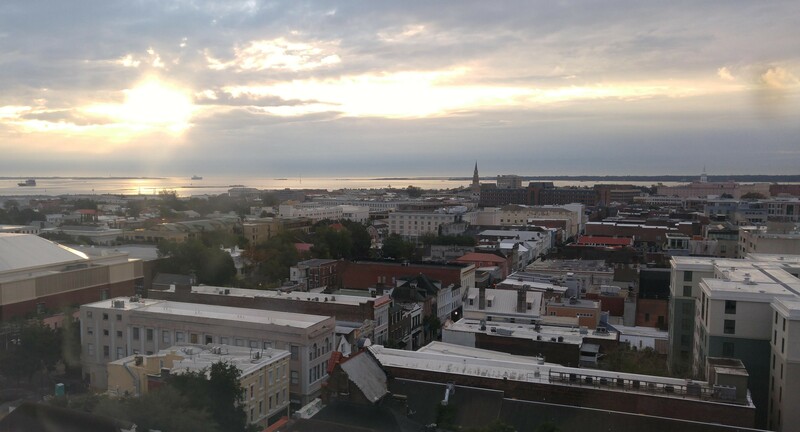 Charleston continues to be a high-quality conference for learning, networking, and socializing. It’s increasingly useful for business librarians and vendors as we work together to grow the business information programming. However I would like to write a short word to the growing number of business vendors and publishers who attend the Tuesday Vendor Showcase. The Charleston Conference focuses on publishing, scholarly communication, and library collections and acquisitions. For most attendees, the conference begins on Tuesday with the Vendor Showcase in the roomy Gaillard Center. 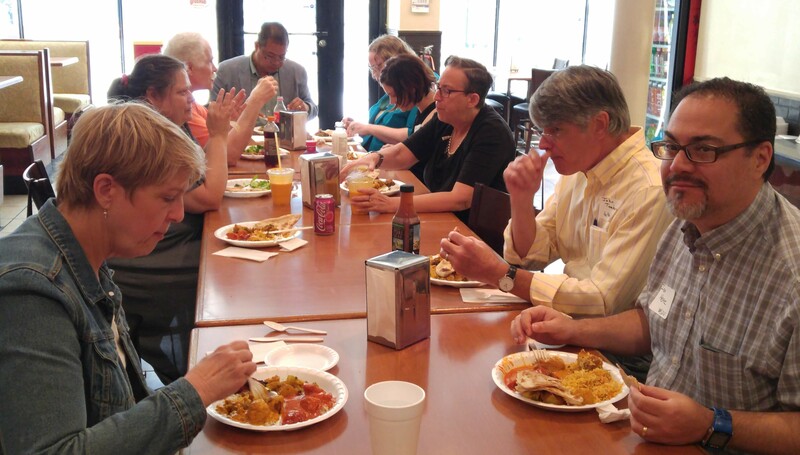 (The Francis Marion hotel got too small for this event as demand for tables kept increasing.) Unlike most major library conferences, this is the only day of exhibiting at the conference. Why? On Wednesday and Thursday — the main programming days of the conference –vendors, publishers, and librarians are encouraged to network, socialize, share, and (most importantly) learn together. This communication happens formally in the plenary and concurrent sessions as well as informally through coffee breaks, meals, and happy hours. So for most of the conference, vendors are not banished to the exhibit hall while the librarians are out and about talking about acquiring, promoting, and teaching vendor resources for their patrons. Instead, vendors are in the middle of the discussions. That interaction is considered one of the strengths of the Charleston Conference and we business librarians who attend love this. The vendors end up with increased influence on librarians, learn more about our needs, and perhaps gain ideas for new or improved products and services. Some vendors have apparently not figured this out yet. On Tuesday, I talked to three or four vendors who were returning home first thing Wednesday morning. I told them they were missing a wonderful opportunity. (I know this is often the boss’ decision, not that of the rep who made the trip.) The airfare and expensive table space are sunk costs; the additional hotel night (or two) and conference registration fees will cost less in comparison. In contrast, InfoUSA, S&P, PrivCo, Bureau Van Dijk, ProQuest, Gale, Sage, and Ebsco are regular attendees beyond the showcase. Those vendor reps even chat with each other at the socials and happy hours. Sometimes some of those reps speak alongside librarians on a topic of mutual interest. 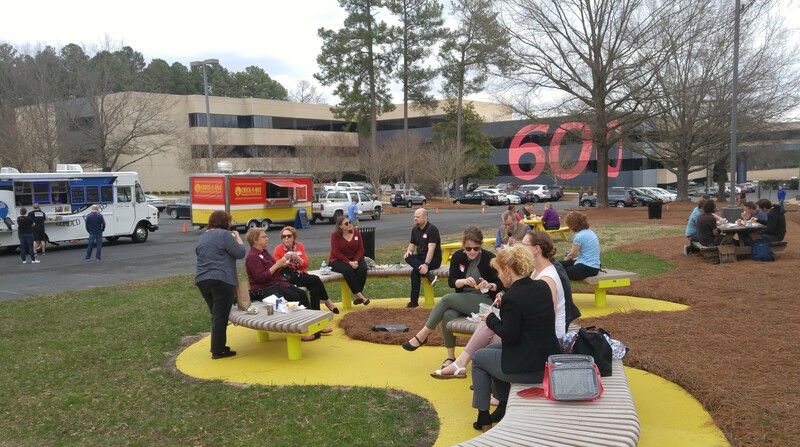 As we continue to grow the business information programming at Charleston, there may be increased opportunities for vendor/librarian programming as well as socializing and networking. Vendors don’t get this opportunity for high-impact engagement at any other conference. Please consider attending past the Tuesday showcase if you haven’t before. 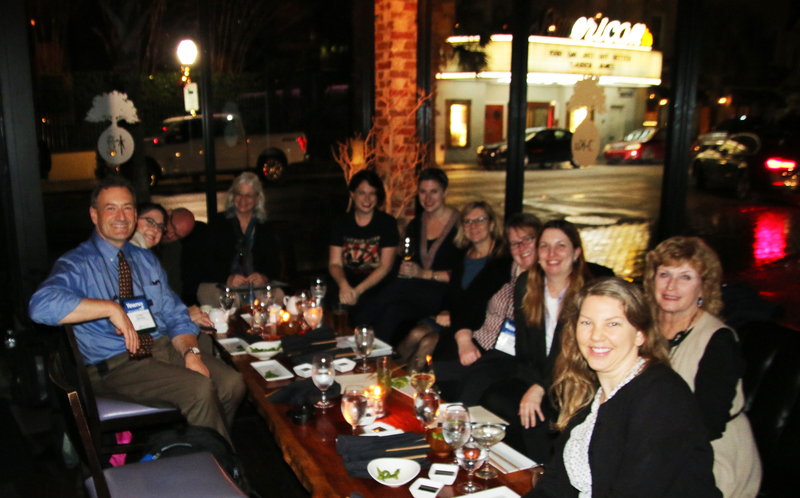 This year, the Charleston Conference on collections, publishing, and scholarly communications moved from a Wednesday-Saturday schedule to a Tuesday-Friday schedule. I preferred the earlier schedule since now I had to miss my Tuesday co-teaching class, and it’s hard to avoid the terrible rush-hour traffic in Charlotte on the return drive home on Friday afternoon. Oh well. Maybe next year if I go, Carol and I will splurge on a Friday night stay and play tourist after the conference wraps up at Friday lunch time. We would be happy to find a business vendor sponsor for a 2018 dinner. It might just be 10-15 folks, so not a huge group. Among the issues specific to business information: Is market research and survey data being collected using bias-free methodologies? Is there a binary representation of gender (and other demographic variables)? What about walk-in use of business databases in a library? This is a particularly important issue for public universities increasing expected to support the people/taxpayers in our states. Most vendors allow walk-in usage (and usually that traffic is a very small percentage of all use) but some do not. At the same time as “Critical business collections”, Kevin Harwell (Penn State), Charles Swartz (SimplyAnalytics), and I presented “And you may ask yourself, well, how did I get here? Library and vendor perspectives on mapping, data visualization, and geographic analytics.” [Does anyone recognize the italicized part?] This is another topic that hasn’t been covered in Charleston before. Kevin and I enjoyed speaking with Charles, the VP of Technology of the company and a PhD. 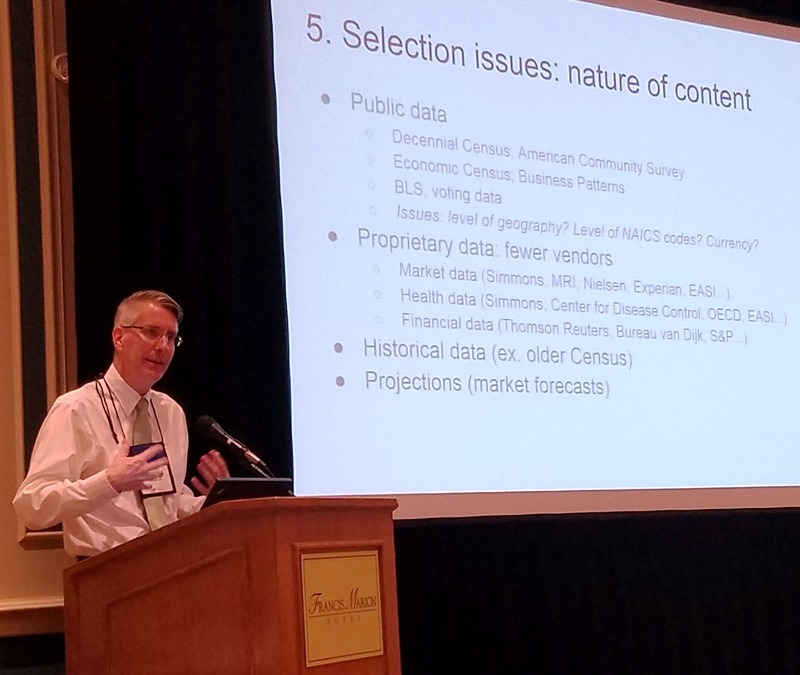 Charles began with an overview of raster versus vector spatial data and then listed the many examples of attribute data available (including “Tree data — species, height, health rating, etc.”– cool). 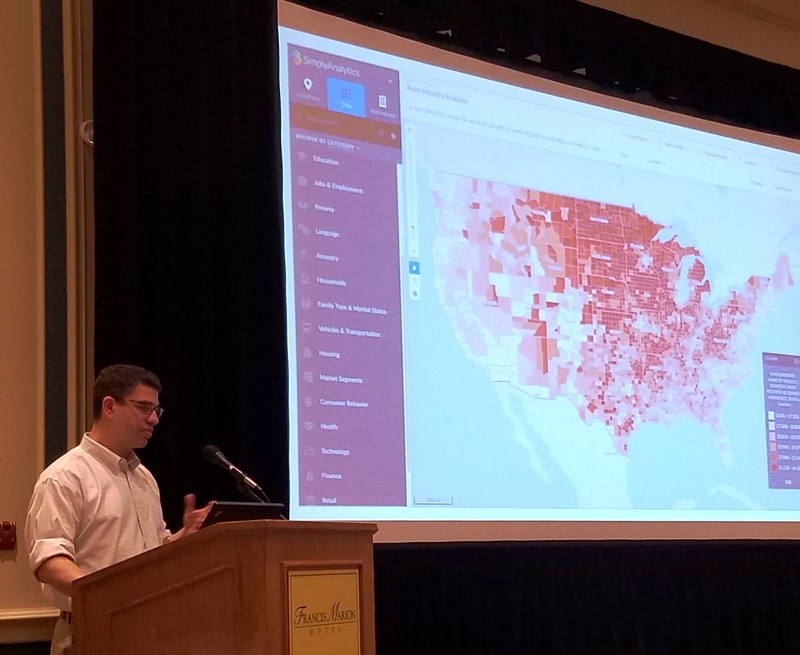 He provided examples of how mapped data can be used, such as “A public library in NC used Hispanic population data in their decision to hire a bilingual librarian” (thanks to NC LIVE being an early subscriber to SimplyMap). The lone examples of SimplyAnalytics Charles provided compared ownership of Chevys in the U.S. to Honda ownership at the county level. Midwestern countries had high ownership for one brand, and coastal states had high ownership for the other – try to guess which ones. Quite a striking difference. Kevin identified various web applications (vendor databases and ArcGIS Online) and desktop applications like ArcMap, MapInfo, Manifold, QGIS, and GRASS GIS. He then compared characteristics of web applications (ex. “Easy to use, but less advanced functionality”) to those of desktop applications (“Oriented to using your own data”). I concluded with selection issues, such as which units on campus might pay for the data, limitations on access, and limits on concurrent users. 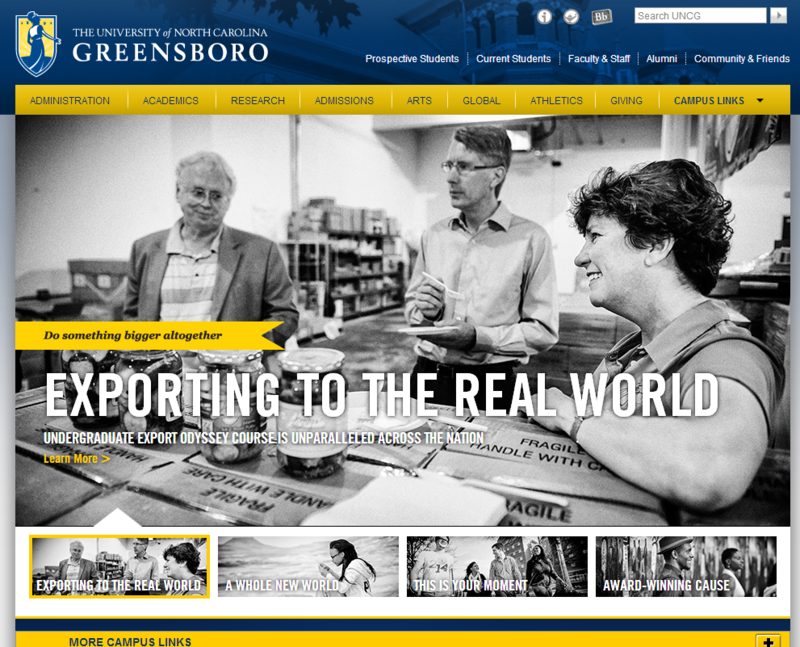 I used WRDS at UNCG as a quick case study. In evaluating web applications, look for the level of geography provided (down to the Census block group? ), the level of NAICS coverage (down to 6 digits? ), currency (recent American Community Survey data? ), and the availability of proprietary psychographic data (from MRI, Simmons, Nielsen, etc.). Finally, try to explore the level of vendor support provided, and the nature of usage data provided. A librarian can easily spend an hour working on a single variable & map with a patron, so we should also collect success stories (ex. for economic development and entrepreneurship projects). We finished our slides in 25 minutes and then had a solid 15 minutes of discussion with the audience until our 40 minute block ran out. 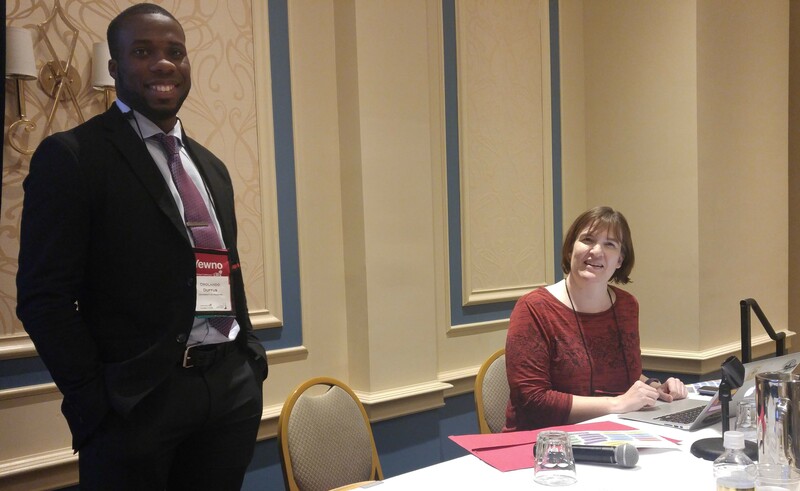 The audience had many questions for Charles, a first-time attendee at the conference. 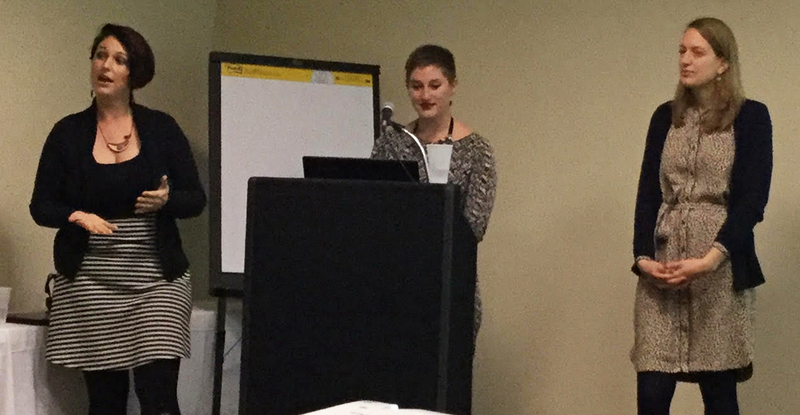 Lauren discussed how she coordinates with her Career Services Center, which has its own librarian. She teaches career research in the first-year seminar for business students, as well as an English class on business writing taken by juniors and seniors. 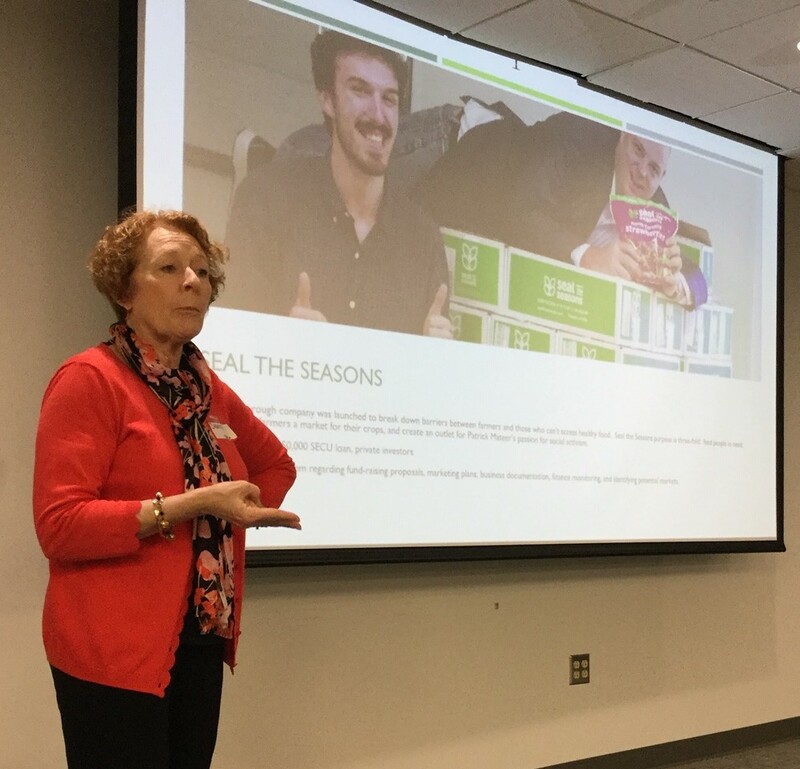 The assignments vary by instructor, but can include writing persuasive letters on “why I am pursuing career ABC in field XYZ.” She also helps train student mentors in financial education. Those mentors provide financial literacy support to fellow students. Networking—Why and How You MUST (and Can!) Do It! 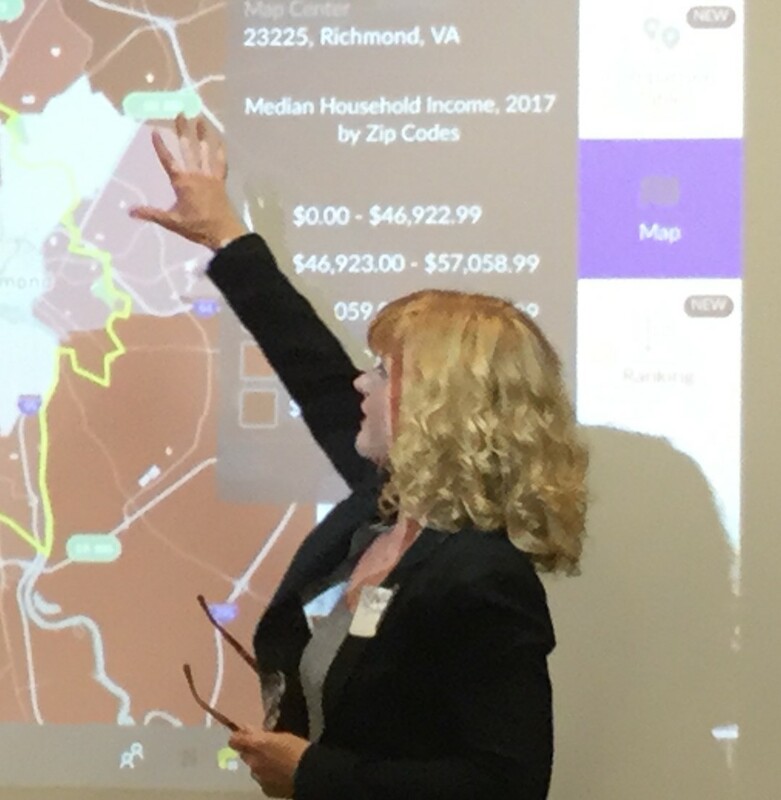 During the Q/A, Heather (if I remember correctly) showed us https://datausa.io/, which aggregates and visualizes useful career data using the BLS and other sources. A growing number of colleges and universities are offering alumni a suite of electronic resources that are either bundled as part of their existing package, negotiated or purchased separately. The value to the vendor may be as an additional revenue line or exposure to a larger population. This might be especially true in business where the need for information and news resources is ongoing. The value to the library may be as a connection to a mission of lifelong learning that can partner with other aspects of the school. Even in a time of tight resource budgets, this can be a good investment by the library. 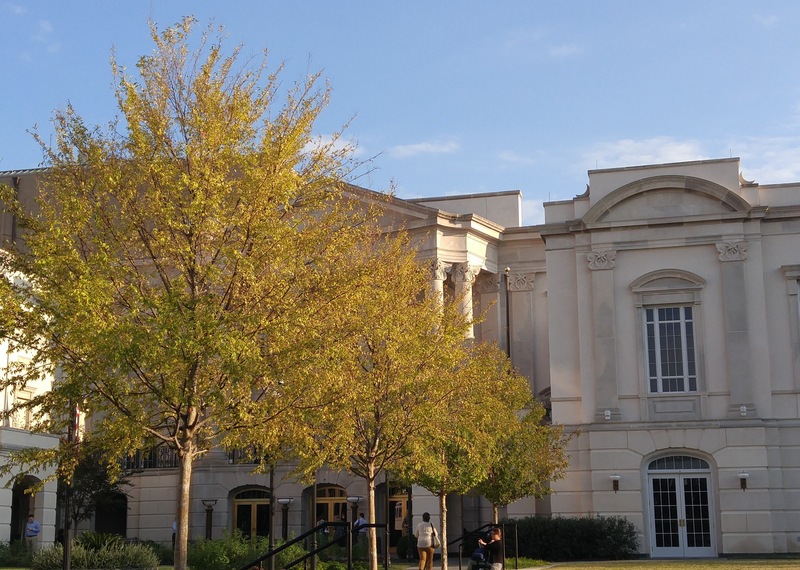 The Tuesday vendor showcase (the one day of exhibits – otherwise librarians, publishers, and vendors attend programs together) took place in the larger Gaillard Center for the first time. Everyone liked the extra elbow room. Of course, the conference also had plenty of programs not provided by business libraries. A morning session on “Publication Ethics, Today’s Challenges: Navigating and Combating Questionable Practices” was very interesting. A Wolters Kluwer director discussed the increasing challenges of dealing with fraudulent article submissions and the publishing industry’s efforts to fight back without limiting submissions by legitimate authors. 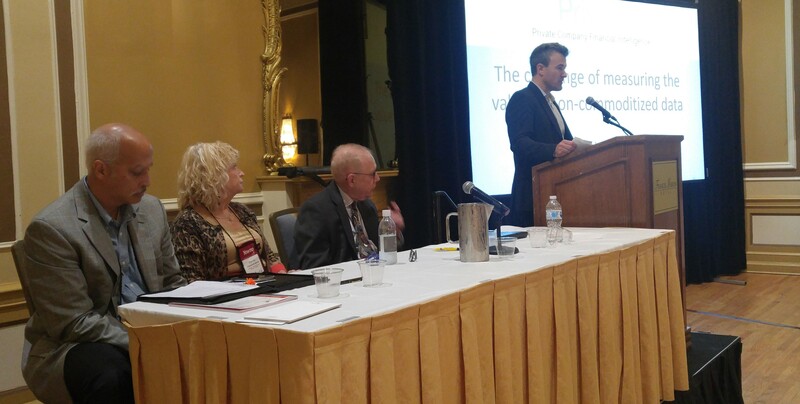 The “Long Arm of the Law” session once again kicked off the final morning with analysis (plus the usual sing-along) of legal developments in fair use and copyright. This panel and the “Legal Issues” section of Against the Grain are my favorite ways of keeping up with the legal issues in our industry. Finally, I also got to hear my wife Carol Cramer (Head of Collections at Wake Forest University) present a lightning round on “A Tempest in a Teapot? Comparing Same-Publisher Sales Before and After DDA Withdrawal”. She addressed the questions “Did individual librarian selectors start buying more print from this publisher, offsetting any savings? Did the publisher make more sales from WFU before or after the change?” It was fast-paced and interesting, and Carol drew the biggest laugh of the hour.